A passion for pediatric medicine eventually led Sammy Totah to serve on the San Diego Workforce Partnership’s Workforce Development Board (WDB). Sammy Totah, PharmD, has been the chief operating officer for Kaiser Permanente San Diego Medical Center since 2013. 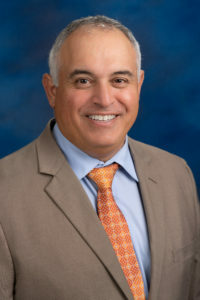 Early in his career while doing pediatric pharmacy, Dr. Totah realized he had a passion for working with youth, which was cemented while serving as a youth and high school football official for 14 years in San Diego. “I enjoy the interaction and leadership development [on the football field] that I can learn and bring back to work,” Dr. Totah says. He also realized, however, that he was really good with numbers and looking at the big picture. Not getting his first-choice residency at a children’s hospital was perhaps a blessing in disguise, then; Dr. Totah landed a general practice residency with an administrative emphasis at Kaiser Permanente, where he found his talents lent themselves to running the business side of the organization better than the clinical side. “I think there are people better than me [at the clinical piece], as much as I hate to admit that,” Dr. Totah said. At the age of 26, Dr. Totah became the manager of a large pharmacy in Los Angeles. In 2006, he became the area pharmacy director for Kaiser Permanente in San Diego before becoming COO. An early-career recurring summer job with an orthopedic surgeon led Dr. Totah to the epiphany that he wants to cultivate a healthy personal life in addition to his professional one. To him, a good work-life balance defined success. Dr. Totah wanted a successful personal life. He is the proud father of three children who are all getting ready to graduate from college, nursing or pharmacy school this year. As for his role on the board, Dr. Totah joined fellow board member Ky Lewis, senior vice president at Sharp Healthcare, in heading the Workforce Partnership’s Regional Council on Health Care Workforce Development, comprising a cross-section of the health care sector including employers, community colleges, labor leaders, as well as other influencers in this industry. Focusing on the health care priority sector, the objectives of the council include validating labor market data with employer experience, identifying trends impacting both large and small employers, exploring innovative approaches to support the attraction, training, and retention of talent and guiding strategic investment of grant funding in the health care sector. Among other initiatives, the council is exploring income-sharing agreements, or ISAs, contractual agreements in which a student receives education funding in exchange for an agreed upon percentage of post-graduation income over a defined time period. Private and/or philanthropic investors front funds to job seekers to help them pay for post-secondary education and wrap-around services. This approach affords students the opportunity to complete an education without worrying about interest rates or decades of payments. In 2017, Kaiser Permanente invested more than $49 million in a variety of ways to help build a healthy region: 12,282 low-income, uninsured, and underinsured members and non-members received financial assistance when they were unable to pay for emergency and medical care, and 114 underserved or at-risk high school students participated in the Summer Youth Employment Program or the Hippocrates Circle Program to gain health care work experience. For its own workforce, there’s the Ben Hudnall Memorial Trust, which covers tuition and fees for staff to undertake professional development opportunities. Recently, Dr. Totah participated in The California Endowment’s (TCE) 21st Century Pathways to Health Careers’ learning community as part of Jobs for the Future’s final fall convening. This two-day event, held at The Grant Hotel, focused on the theme “Creating the Future of the Health Workforce,” and gave attendees the space to discuss solutions to common challenges and share successes in sustainability, equity, and employability and 21st century skills. Approximately 200 attended breakout sessions and site visits, including Rady Children’s Hospital and the Metro Career Center. If you are interested in learning more about the Workforce Partnership’s Regional Council on Health Care Workforce Development, please contact business@workforce.org.